Hazards exist in every health care facility workplace in many different forms: physical hazards such as sharps, slippery floors, and falling objects, and exposure to chemicals, biologics, and radiation through a myriad of other potentially dangerous situations. Infectious disease outbreaks such as pandemic influenza, MERS, and the 2014 Ebola Viral Hemorrhagic Fever (EBV) crisis emerged as additional threats to nurse’s health and safety. Nurses play a role in the transmission of infectious disease in health care facilities given their risk of acquiring a disease and then transmitting it on to patients and colleagues. Nurses may work with and come into contact with dangerous chemicals in the workplace. Yet evidence suggests that compliance with wearing PPE is inadequate [1,2]. During the fall of 2014 four laboratory confirmed cases, including one death, and two locally acquired cases of EBV in healthcare workers were reported in the United States . The experience at the Dallas Texas Presbyterian hospital revealed that not all hospitals in the U.S. are prepared to deal with EBV patients . In fact, nurses working at the hospital expressed serious concerns regarding the directions they were given regarding the protective measures against EBV . In the midst of a major public health event nurses risk exposure to harmful and potentially deadly materials. Protecting both nurses and other health care providers against secondary contamination and exposure to harmful biological and chemical substances is thus a priority. Education and training of all nurses on the appropriate selection and proper use of personal protective equipment (PPE) will be critical to enhancing readiness. Mobilizing U.S. hospitals in preparation for large scale exposures and emerging infectious diseases will involve a great deal of time and financial resources. These hurdles must be addressed if the U.S healthcare system is to sufficiently prepare itself for a large scale chemical event or another likely encounter with EBV, MERS or any other deadly virus. During Congressional testimony by National Nurses United, one of the nation’s largest nurses’ unions, the group cited a survey of approximately 3,000 nurses working in over 1,000 hospitals. Results showed that 85% of those surveyed reported not feeling as if they had been sufficiently trained and that their institutions were underprepared to treat a suspected case of EBV. Equally troubling, 68% of respondents stated that their organizations had not detailed to them policies related to admission of patients infected by EBV . These figures portend alarm because perceived preparedness oftentimes translates into real preparedness. Gamage et al. 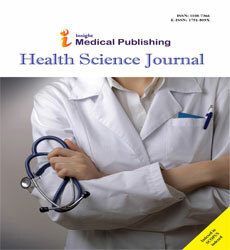 (2005) found a strong correlation between amount of infection control training and in-hospital risk of SARS infection . Additionally, their findings suggest that health care workers who perceive that the amount of PPE available is inadequate were at higher risk for contracting SARS. Ultimately, hospitals are responsible for creating safe environments for nurses to render clinical care and for providing their staff adequate access to PPE. Nurses must be assured that they are not putting themselves, their families and friends, or their colleagues in harm’s way. This becomes even truer if “the outbreak escalates and additional health care workers are required to assist. Staff may refuse to treat patients unless they feel adequately protected”. Interestingly, the American Hospital Association’s (AHA) has argued that its member hospitals should be commended for their work in preparing for potential new cases of EBV. The AHA, in a statement to the U.S. Senate Committee on Appropriations, wrote that further mandatory enforcement of CDC PPE guidelines without accompanying financial support would prove economically unfeasible for many of its 5,000 member hospitals. According to the organization the primary funding mechanism for preparing hospitals for natural and manmade emergencies, the Hospital Preparedness Program (HPP), has been left underfunded. Since its inception in 2002 the program’s annual budget has been gradually reduced, from $515 million in its early years to less than 50 percent of that, $255 million, for fiscal year 2014 . Clearly, not all hospitals in the U.S. are prepared to deal with emerging infectious disease outbreaks. Now is certainly the time to prepare. With MERS, EBV and pandemic influenza looming on the horizon hospitals would be well served to ramp up their preparedness programs. Remarkable change has occurred in how nurses, other healthcare providers and the public at large view the use of PPE. When Thomas Eric Duncan, the first case of a patient being diagnosed with Ebola in the United States, was first treated at Texas Health Presbyterian in late September 2014 nurses reportedly wore non-impermeable gowns front and back, non-taped gloves, and allegedly were told that N-95 masks were optional . Some hospitals have successfully established citywide cross-hospital collaboratives for infectious disease preparedness . The Centers for Disease Control and Prevention (CDC) updates daily its website (http://www.cdc.gov/vhf/ebola/index.html) dedicated to informing hospitals, healthcare workers, and the general public on the latest best practices for preventing the spread of EBV and MERS (http://emergency.cdc.gov/han/ han00380.asp). Most important, guidelines from the Centers for Disease Control and Prevention can assist hospitals with specific preparedness activities , resources for health care professionals  and with guidelines for the use of PPE by health care workers caring for patients with emerging infectious diseases . Education and training of all staff (nurses and other health care workers, and environmental services staff) on the appropriate selection and proper use of personal protective equipment (PPE) will be critical to enhancing readiness. Others have called for the establishment of a professional association for healthcare professionals in emergency preparedness as a way of ensuring that preparedness standards are met . 5. With highly infectious diseases such as MERS and Ebola, infection control must begin before the patient even enters the hospital. Facility staff should designate appropriate areas for screening patients and for safely isolating suspect exposed or infected patients. To fully understand the need for and the appropriate use of personal protective equipment nurses must first understand the fundamental concepts of hazard identification and risk assessment. A hazard, according to the Occupational Safety and Health Administration (OSHA), is anything with the potential to cause personal injury or illness [15,16]. In addition to injuring humans, a hazard poses potential of damage to property or the environment. OSHA requires health care employers to protect their employees from existing workplace hazards through the use of engineering or work practice controls. If the machine or work environment can be physically changed to prevent employee exposure to the potential hazard, then the hazard can be eliminated with an engineering control. If employees can be removed from exposure to the potential hazard by changing the way they do their jobs, then the hazard can be eliminated with a work practice control. When these controls are not feasible or do not provide sufficient protection, the use of PPE is required . "Hazard assessment" is the process of identifying the hazards associated with defined tasks that the nurse is expected to do, prescribing personal protective equipment and other relevant protection measures, which must be employed to reduce the risk from the hazards. In this case, exposure to EBV is the ‘hazard’. "Certification of Hazard Assessment" is a written document detailing the hazard assessment(s) for (a) particular task(s). Workplace assessment is an OSHA requirement (Figure 1) and the health care facility industrial hygiene/safety office or department supervisor is ultimately responsible for ensuring that hazard assessments are performed and the certification(s) written and posted. These individuals may delegate or contract the labor involved in this process but cannot reassign or disclaim the responsibility . Personal protective equipment, commonly referred to as "PPE", is equipment worn to minimize exposure to serious workplace injuries and illnesses. These injuries and illnesses may result from contact with chemical, radiological, physical, electrical, mechanical, or other workplace hazards. Personal protective equipment may include items such as gloves, safety glasses and shoes, earplugs or muffs, hard hats, respirators, or coveralls, vests and full body suits . The routine use of PPE in daily clinical practice protects nurses from the specific threats of exposures to certain airborne biological particles (blood and body fluids), chemical agents, splashes, radiation exposures, and punctures. In general, when treating a patient who has been exposed or potentially exposed to a chemical or biologic, nurses should always adhere to the Occupational Safety and Health Administration’s (OSHA) guidelines on personal protective equipment . In the Code of Federal Regulations Section 1910, OSHA outlines the types of PPE that should be worn in various emergency situations. In general, there are four different types of PPE, which provide different levels of protection. OSHA classifies these as Levels A, B, C, and D (Table 1). The level of PPE required for nurses varies depending on the agent involved, the risk of exposure to the contaminant, and the assigned responsibilities of the nurse during the event. Nurses need to know where in there organization PPE supplies are stored, how to access it quickly, and who they can rely upon for assistance in ensuring the correct use (Figure 2). This is critically important as it relates to the use of PPE when caring for EBV patients. Table 1: OSHA’s Level A, B, C, and D Protection Against Chemical Substances. 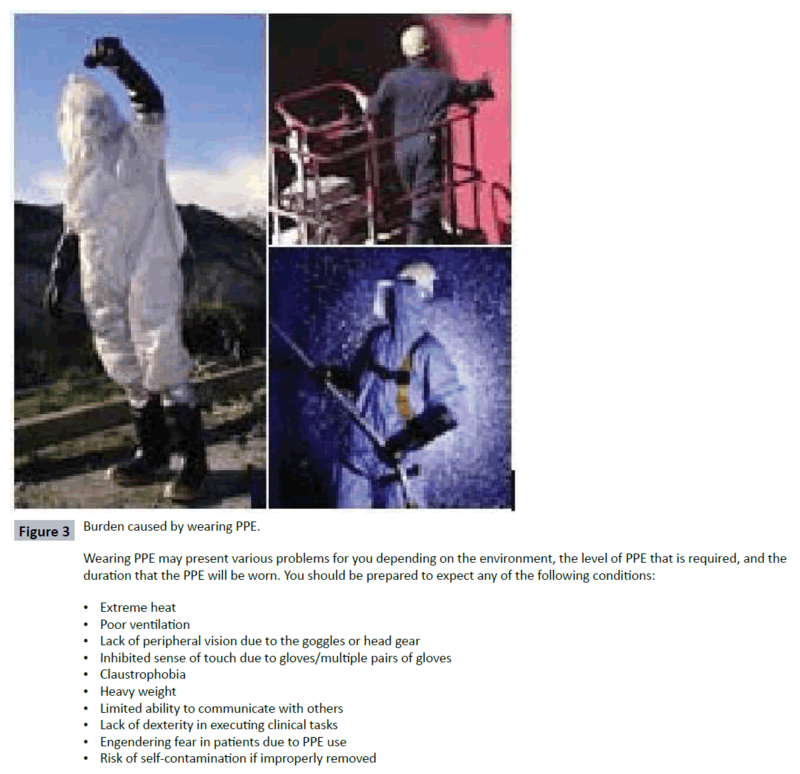 Figure 2: Key Considerations for the Use of PPE. As a general rule, personal protective equipment should never be used as a substitute for engineering, work practice, and/or administrative controls. 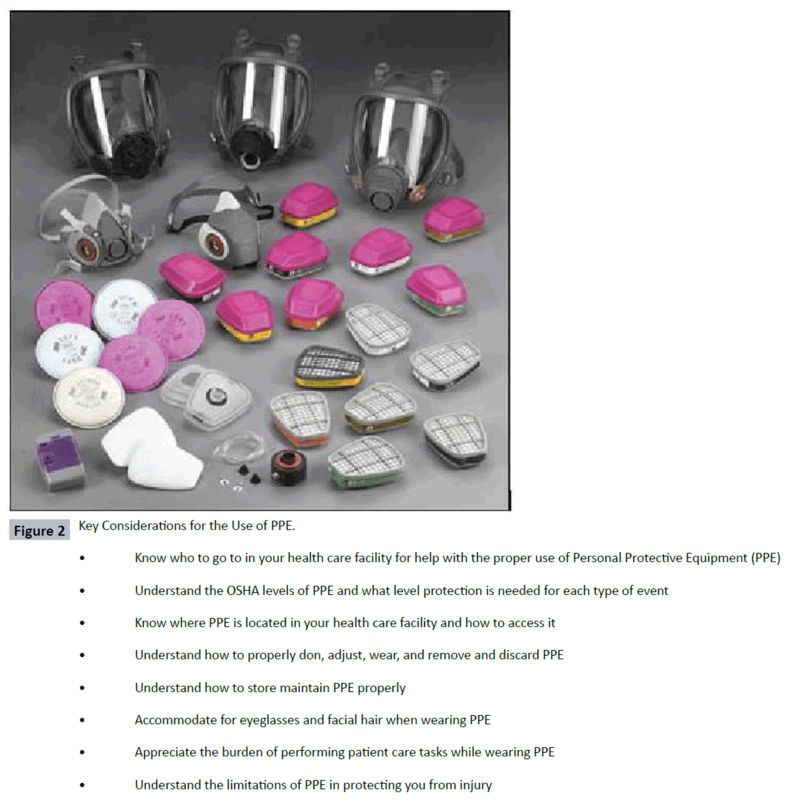 PPE should be used in conjunction with these controls to provide for nurse safety and health in the work place. Nurses should note that personal protective equipment includes all clothing, footwear and other work accessories designed to create a barrier against workplace hazards. According to OSHA, all PPE clothing and equipment should be of safe design and construction, and should be maintained in a clean and reliable fashion. Employers should take the fit and comfort of PPE into consideration when selecting appropriate items for their workplace as the use of (wearing) PPE creates a burden upon the health care provider (Figure 3). PPE that fits well and is comfortable to wear will encourage employee use of PPE. Most protective devices are available in multiple sizes and care should be taken to select the proper size for each employee. If several different types of PPE are worn together, the nurse should make sure they are compatible. If PPE does not fit properly, it can make the difference between being safely covered or dangerously exposed. It may not provide the level of protection desired and may discourage the nurse’s use. Figure 3: Burden caused by wearing PPE. It is important that nurses appreciate the importance of selecting the appropriate level of PPE but also how to ‘don’ (put it on) and ‘doff’ (remove the PPE) correctly without self-contaminating. This requires specialized training and evaluation of PPE skills by a trained observer. Correctly donning and doffing PPE is critical to its effectiveness, particularly as it relates to caring for highly infectious patients. Healthcare providers preparing to engage in or finishing direct patient care should be walked through the process of putting on or removing on PPE by a trained observer qualified to offer guidance and corrective instruction if protocol is not fully adhered to. The observer should also be familiar with the exposure management plan in the event of a break in procedure . The practice of employing a trained observer to ensure that healthcare providers correctly don and doff PPE adds an additional layer of protection. While caring for the first two Ebola patients transported to the U.S. for treatment Emory University staff were always observed by another team member when putting on or taking off PPE . The CDC recommends that healthcare facilities engage in continuous safety checks through direct observation of healthcare workers during the PPE donning and doffing processes . Regardless of the size of the hospital, the CDC recommends that all healthcare facilities in the United States ensure that their healthcare professionals attain competency in the use of all PPE applicable to treating highly infectious patients as well as to stockpile adequate stores of PPE equipment. Additionally, per CDC recommendations, protocols should be developed to safely transport suspected Ebola patients to facilities designated to care for patients with confirmed Ebola . Decontamination is the process of removing (or reducing) contaminating agent(s) from victims/patients while keeping nurses and other staff protected from being secondarily exposed and preventing further contamination of the environment. Decontamination must be available and provided quickly to patients whenever a known or suspected contamination has occurred through contact with an aerosol, solid, or liquid hazardous substance. This includes blood and body fluids from infected EBV patients. Decontamination may be implemented on-scene and/or in the hospital setting. Nurses should be familiar with the work zones in either setting. Viruses and specifically EBV, can remain detectable on solid surfaces for days . Consequently, precautions should be taken to reduce the potential risk of transmission from contaminated surfaces to HCWs. The U.S. Environmental Protection Agency has available a list of disinfectants approved for use against EBV in hospitals on hard, non-porous surfaces. These products, as the agency states, will not mention claims of being effective against EBV but, instead, are EPA-registered for use against non-enveloped viruses (e.g. norovirus, rotavirus, adenovirus, poliovirus). Product use labels should be followed when disinfecting against EBV . The University of Nebraska Medical Center has published on its experiences in caring for EBV patients and the solid and liquid waste demands of doing so. The institution cautions other hospitals to anticipate large amounts of solid waste. Their experience indicated that a single patient could produce over 1,000 pounds of solid waste, all of which had to be processed through autoclave machines on its way out of the dirty anteroom. Liquid waste was treated equally carefully by being placed into the toilet along with hospital grade disinfectant at the manufacturer recommended ratio and held for 2.5 times the recommended contact time before being flushed [22-26]. Nurses will remain at the forefront of any effort aimed at treating those impacted by biological or chemical events. Hospital preparedness requires the establishment of safe environments for nurses to render clinical care including conducting organizational hazard assessments, provision of appropriate and adequate supplies of PPE, and clean-up and decontamination facilities to maintain safety and the integrity of the hospital environment. Hospitals are responsible for providing nurses with the necessary technical and material support to do their job. Nurses are responsible for understanding the fundamental concepts of hazard assessment, decontamination and the proper selection and regular use of personal protective equipment. They can provide leadership in reviewing and enhancing their organization’s current disease containment and chemical incident response strategies. Nichol K, Bigelow P, O'Brien-Pallas L, McGeer A, Manno M, et al. (2008) The individual, environmental, and organizational factors that influence nurses' use of facial protection to prevent occupational transmission of communicable respiratory illness in acute care hospitals. Am J Infect Control 36: 481-487. Mitchell R, Ogunremi T, Astrakianakis G, Bryce E, Gervais R, et al. (2012) Canadian Nosocomial Infection Surveillance Program Impact of the 2009 influenza A (H1N1) pandemic on Canadian health care workers: a survey on vaccination, illness, absenteeism, and personal protective equipment. Am J Infect Control 40: 611-616. Centers for Disease Control and Prevention (2014) Update of the Ebola Outbreak, Case Counts. MSNBC (2014) Texas Health Presbyterian Nurses Speak Out for 1st Time: "This Could Happen to Any Hospital?. The ebola crisis: Coordination of a multi-agency response (2014) Hearing before the Committee on Oversight and Government Reform, House of Representatives, 113th Cong. (testimony of Deborah Burger). Gamage B, Moore D, Copes R, Yassi A, Bryce E (2005) Protecting health care workers from SARS and other respiratory pathogens: A review of the infection control literature. Am J Infect Control 33: 114-121. MacIntyre CR, Chughtai AA, Seale H, Richards GA, Davidson PM (2014) Respiratory protection for healthcare workers treating Ebola virus disease (EVD): Are facemasks sufficient to meet occupational health and safety obligations? Int J Nurs Stud 51: 1421-1426. U.S. government response: Fightingebola and protecting America (2014) Statement before the Committee on Appropriations, United States Senate, 113th Cong. (statement of the American Hospital Association). Lateef O, Hota B, Landon E, Kociolek LK, Morita J, et al. 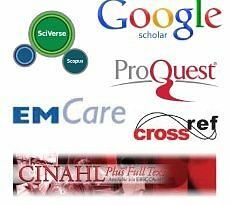 (2015) Chicago Ebola Response Network (CERN): A Citywide Cross-hospital Collaborative for Infectious Disease Preparedness. Clin Infect Dis 61: 1554-1557. Centers for Disease Control and Prevention (2014) Detailed hospital checklist for Ebola preparedness. Centers for Disease Control and Prevention (2015) Updated Information and Guidelines for Evaluation of Patients for Middle East Respiratory Syndrome Coronavirus (MERS-CoV) Infection. Centers for Disease Control and Prevention (2014) Guidelines on personal protective equipment to be used by health care workers during management of patients with Ebola disease in U.S. Hospitals Including Procedures for Putting On (Donning) and Removing (Doffing). Medcalf S, Hansen K, Sanger K (2015) Time for a professional association for healthcare emergency preparedness. Health Secur 13: 184-185. Occupational Health and Safety Administration (2014) Hazard Assessment and the Use of Personal Protective Equipment. Occupational Health and Safety Administration (2014) Guidelines for the Use of Personal Protective Equipment. Centers for Disease Control and Prevention (2014) Guidance on Personal Protective Equipment To Be Used by Healthcare Workers During Management of Patients with Ebola Virus Disease in U.S. Hospitals, Including Procedures for Putting On (Donning) and R. In Centers for Disease Control and Prevention. Bray M (2014) Diagnosis and treatment of Ebola and Marburg virus disease. In UpToDate. Chevalier MS, Chung W, Smith J, Weil LM, Hughes SM, et al. (2014) Morbidity and mortality weekly report: Ebola virus disease cluster in the United States ? Dallas County, Texas, United States. CDC. 63: 1-3. Sagripanti J, Rom AM, Holland LE (2010) Persistence in darkness of virulent alphaviruses, Ebola virus, and Lassa virus deposited on solid surfaces. Arch Virol 155: 2035-2039. Disinfectants for UseAgainst the Ebola Virus (2014) In U.S. Environmental Protection Agency. Lowe JJ, Gibbs SG, Schwedhelm SS, Nguyen J, Smith PW (2014) Nebraska Biocontainment Unit perspective on disposal of Ebola medical waste. Am J Infect Control 42: 1256-1257. Centers for Disease Control and Prevention (2015) Resources for Health Care Professionals. Ebola PPE Price Index (2014) In ECRI Institute. Emergency Care Research Institute (2014) Ebola PPE Price Index. Masks and N95 Respirators (2014) In U.S. Food and Drug Administration.